For the past three years, The A.V. Club has devoted the month of December to reflecting on our favorite holiday entertainments, and this year is no different. It’s a feature so nice, it’s never had the same name twice, and this year it’s the 12 Days Of Non-Denominational Winter Holidays. One of my many favorite things about the Serial podcast and its subsequent popularity is that it has re-identified the possible audience for an aural medium like radio. In the days before television, creative storytellers used the radio to popularize their narratives, using only talented writers, amazing voice actors (many who then jumped to movies and TV), and that great lost artist that is the sound-effects man. In real life, Benny was exceedingly generous with his cast and crew, but the radio character he created for himself—cheap, petty, narcissistic, effeminate at times—made audiences howl like no one else in the radio era. His comedy program landed near the top of the Hooper ratings in 1937 and stayed there for years. Although he eventually made the jump to television (when he was already in his 50s) and also made a few movies (his best is probably 1942’s To Be Or Not To Be), none of these efforts ever topped his radio ones. Benny’s persona was never funnier than in his annual holiday programs. Sometimes Jack would throw a party or attend another festive gathering, but the perfect pairing of Benny and his cheap ways came when he would head to a department store to shop for the holidays. 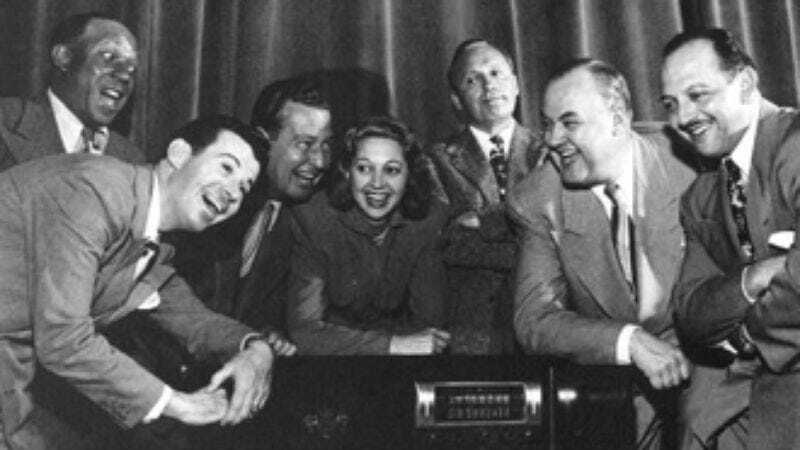 Accompanied by his real-life wife Mary Livingstone, who played his wisecracking friend on the show, he would attempt to buy his announcer Don Wilson a Christmas present, such as $1.98 cufflinks, a pack of golf tees, or in the 1946 “Jack Buys Don Shoelaces” episode of The Lucky Strike Program Starring Jack Benny, shoelaces. These episodes ran true to form from year to year. (In the pre-rerun era, listeners didn’t mind a little repetition.) At the store, Jack would run into the other members of his cast doing their shopping, such as boozy bandleader Phil Harris. Raspy-voiced Eddie Anderson, who had appeared in such legendary films as Gone With The Wind and Cabin In the Sky, portrayed Benny’s valet, Rochester. Benny’s program made Anderson the first African-American performer to have a regular role on radio; Rochester also frequently got the best of his white employer, unusual for the time period. Childlike tenor Dennis Day would also show up at the department store to sing his usual song per episode, and announcer Don Wilson and the Sportsmen Quartet’s sponsor push for Lucky Strike cigarettes would be woven into the storyline, as was standard for the era. Floorwalker Frank Nelson, who often played a foil to Benny, can be identified with his trademark “Yeeeeesss?” Some of the characterizations—like an exaggerated Southern accent or the Jewish Mr. Kitzel—appear caricature-like from today’s perspective. In fact, after World War II, humor tied to nationalities fortunately went on a downswing. The combination of all these elements—Benny’s cemented stingy and conceited persona, the magnified personalities like Harris and Anderson he surrounded himself with, Livingstone’s dry wisecracks (when Benny asks if he should buy a girlfriend a lipstick, she deadpans: “I don’t know. She got lips?”), the running jokes that the audience looked forward to—made Benny’s holiday episodes a magical event every December. But the MVP who binds the show is undoubtedly Mel Blanc. Even without the Benny show, Blanc would forever be remembered as the “man of a thousand voices,” behind such legendary animated characters as Bugs Bunny, Yosemite Sam, and Barney Rubble. But Mel Blanc was as popular in radio as he was in cartoons. In radio, the more voices and accents an actor could do, the better, and the most versatile could play several characters on a single program. But few could even come close to rivaling Blanc’s gift for vocal effects. He started expanding his range on the Benny show when the sound effect for the Maxwell, Benny’s broken-down car, didn’t work. Blanc grabbed the mic and filled in, making automobile noises he would later mimic in the ’70s cartoon Speed Buggy. His depiction was so successful, Benny decided to have Blanc become the car permanently. Blanc also famously portrayed Benny’s pet polar bear Carmichael, violin teacher Professor LeBlanc, the train announcer (“Anaheim, Azuza, and Cucamonga”), and for the holidays, the tormented department store clerk. In the 1946 holiday episode, Blanc’s is the first voice we hear after the announcer’s. He starts out as a nice, accommodating clerk, even as Benny hems and haws over shoelaces. Then Benny’s supporting cast weaves in and out, with some well-seasoned bits (like the gambling insider who rates elevators like racehorses), and some that didn’t age as well (like the singsong “happy” guy). Benny visits Blanc’s clerk three times in the half-hour, and Blanc’s mania escalates until he hits his all-out, highest-level Yosemite Sam-like pitch at the end (the voice Blanc always said was the most difficult, as it strained his vocal chords). Benny’s clueless character hurries away as a crowd forms and his selfish, cheap persona claims another victim. But seeing Benny and cast on TV never rivaled the beauty of the radio shows for me. It could never match the holiday department store I had set up in my head. There’s an astonishing bit in comedy that can only happen on radio: the aural joke. When Jack goes to the perfume counter, the bit comes in the surprise when we hear a thug’s voice. Or the amazing way the Sportsmen mimic windup soldiers winding down. And Blanc’s full-on frenzy is more potent when it’s fueled by voice only. We can fast-forward past Day’s song and some of the outdated references, but overall the Benny shows still stand as the best of audio: With the success of Serial, perhaps it’s a medium that will be soon be getting another look.